Let me explain. I’m between houses. When you have a house, it’s easy to throw your dog poop in your outside trash receptacle. Cause you don’t want to bring that sh-t indoors. Right now I’m living in an apartment, so I must immediately bag the doggie doo when she goes. Typically, she does this in the middle of a walk. In that case, it’s easy to cross the street and throw out the crap in the large apartment dumpster. Other times, my dog goes just outside our back door in the early morning or late night hours. In that case, who wants to cross the street to throw out dog poop? My next door neighbors rather rudely leave bags of dog poop piled up by their front door. I’m so grossed out. I’ve seen these folks take out their trash and leave the dozen bags of dog poop sitting there. Solution: A pickle bucket. Getting back to the pickle bucket. It was obvious we needed some kind of outdoor receptacle for our patio in the back of our apartment. A temporary holding spot for doggie make. 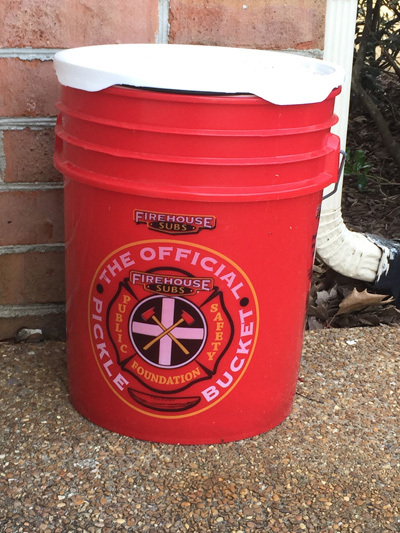 And Firehouse Subs (hope you haven’t lost your appetite) sells their used pickle buckets. Not only is buying a pickle bucket kind to the environment (reuse instead of new), it’s cheap (only $2). And the money goes to the foundation. The only negative is the pickle smell, but Self Reliant School did a whole post on getting the smell out! I wanted a bucket with a lid, and I got it. It works wonderfully. And it looks so much cuter than a hardware store bucket that costs three times as much. What do you put inside your pickle bucket?